It doesn't just stop there though. You can use this technique to make your own custom pose estimation models. To see how, take a look at the example program for training these pose estimation models. Have you evaluated this implementation quality and/or speed-wise ? How does it compare to the numbers reported in the original research paper ? Yes. The results are comparable to those reported in the paper both in terms of speed and accuracy. Does the "real time pose estimation algorithm" use a face detector every frame or use the previous frames output for current frame estimation? You can run it either way. The input to the pose estimator is a bounding box for a face and it outputs the pose. The included example program shows how to get that bounding box from dlib's face detector but you could just as easily use the face pose from the previous frame to define the bounding box. In the paper, "One Millisecond Face Alignment ..." they output 194 landmark points on the face, however the implementation provided in dlib only outputs 68 points. Is there a way to easily produce the 194 points using the code provided in dlib? You can get the training data from the HELEN dataset webpage http://www.ifp.illinois.edu/~vuongle2/helen/. I compiled the example from v18.10 and get an error, DLIB_JPEG_SUPPORT not #defined Unable to load the image in file ..\faces\2007_007763.jpg. You need to tell your compiler to add a #define for DLIB_JPEG_SUPPORT and then link it with libjpeg. If you are unsure how to configure your compiler to do this then I would suggest using CMake (following the directions http://dlib.net/compile.html). CMake will set all this stuff up for you. Hi thanks for dlib ! CMake will try to find a version of libjpeg that is installed on your system and use that. If it can't find a system version of libjpeg it prints out that it didn't find it. I then have CMake setup to statically compile the copy in the dlib/external/libjpeg folder when a system install of libjpeg is not found. So that's why you get that message. More importantly, I want to make sure dlib always compiles cleanly with cmake. So can you post the exact commands you typed to get the error C2371: 'INT32' : redefinition; different basic types, in jmorecfg.h error? I don't get this on any of the systems I have. The string INT32 doesn't even appear in any code in the dlib folder so I'm not sure how this happened. That google drive link doesn't work for me. Can you post the image another way? Also, is the image extremely large? That's the only way I would expect an out of memory error. Huh, I don't know what's wrong. That's not a large enough image to cause an out of memory error. I also tried it on my computer and it works fine. What system and compiler are you using? Also, what is the exact error message you get when you run the image though the face_landmark_detection_ex example program that comes with dlib? I am facing problem, while trying to run face detection program in visual studio 2012. Then you run the face_landmark_detection_ex executable. Can you tell me the paramters you trained on the ibug dataset ? If I recall correctly, when training on iBUG I used the default dlib parameter settings except I set the cascade depth to 15 instead of 10. I am wondering if you can help me with a speed issue I am having. I am trying to set up a test using my laptops webcam (opencv) to add the face pose overlay in real time using the example code provided. The face detector and full_object_detection functions seem to be taking multiple seconds per frame to compute (480x640). I have compiled dlib using cmake on visual studio 2013 with the 64 bit and avx flags. I was wondering if you could point me in the right direction to reach this one millisecond number the paper boasts. Did you compile in release or debug mode? Ah, yes that was the problem. I had assumed setting cmake to release would default the library build to release as I only changed the example code build settings in VS.
when tranining ibug dataset, did you generate the bounding box yourself, or just use the bounding box the 300 face in wild conpetition supplied? I generated the bounding boxes using dlib's included face detector. This way, the resulting model is calibrated to work well with dlib's face detector. 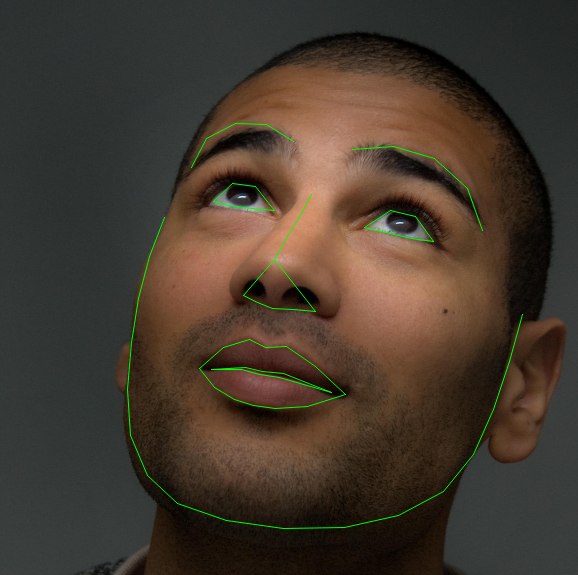 if the detector faild to detect the face, how did you generate the bounding box? thanks for you reply. In that case I generated it based on the landmark positions. However, I made sure the box was sized and positioned in the same way the dlib detector would have output if it had detected it (e.g. centered on the nose and at a certain scale relative to the whole face). Hello, great work and works very fast. Is there any method to estimate Yaw, Pitch, Roll with these estimated landmarks? The output is just the landmarks. When I try to train shape predictor with more than 68 landmarks, it fails some assertions "DLIB_CASSERT(det.num_parts() == 68" in lbp.h, render_face_detections.h so on. How can I train with more landmarks? One last question for better training. Do I need to specify the box rectangle [box top='59' left='73' width='93' height='97'] correctly ? Or can I leave it like 0,0,width,height? If I need to specify box, do I need to use dlib face detector to locate faces? You have to give a reasonable bounding box, but you can get the box any way you like. However, when you use this thing in a real application you will pair it with some object detector that outputs bounding boxes for your objects prior to pose estimation. So it's a very good idea to use that same object detector to generate your bounding boxes for pose estimation training. Have you only use the ibug dataset (135 images) to train the model shape_predictor_68_face_landmarks ? That model is trained on the iBUG 300-W dataset which has several thousand images in it. Hi, Davis. I get the input from a camera. So the face landmarks are displayed in a real-time video. But the processing time duration between frames is quite slow. How can I make it faster? Did you compile with optimizations and SSE/AVX enabled? How big are the images you're giving it? Then it should be very fast. You must be either timing the wrong thing or you haven't actually compiled with optimizations. Is the executable you are running output to a folder called Debug or Release? How are you timing it? If the executable is in the Debug folder then you haven't turned on optimizations. Visual studio outputs the optimized executable to a folder called Release. When you open visual studio and compile the executable you have to select Release and not Debug or it will be very slow. How can I get the coordinates of face landmarks after the normalization. I mean the coordinates according to the small face window. Take the output of get_face_chip_details() and give it to get_mapping_to_chip(). That will return an object that maps from the original image into the image chips which you can use to map the landmarks to the chip. Should I write the function as following? And how to return the object? No. Look at the signatures for those functions and you will see how to call them. The object is returned by assigning it into a variable with the = operator. My question: How to use the point_transform affine p to return an object? Thx for ur help. It really solved my problem!!! Thank you so much.Davis, u r so kind and patient!! Hi Davis, this is an excellent work!! I've been trying to apply this to another different shape, training 4 images (640x480) with 180 landmarks each and default parameters of the train_shape_predictor_ex. Turned ON the SSE2 optimizations in the CMakeCache file and compiled in Release mode on Ubuntu. It's been 3 hours and keeps saying "Fitting trees..."
I don't know what's wrong, I already tried this shape before with less landmarks (68) and bigger size images and seemed to worked kind of properly. But now even with the optimizations is hanging or something. With just 4 images it shouldn't take more than a minute to run, if that. Did you run the example program unmodified or have you changed the code? First I ran the example unmodified, it worked. Then I changed the code a little bit, basically just removed the interocular distance part because I don't need it for this object, load four random size images with 68 landmarks, it worked. Try running it in CMake's Debug mode for a few minutes. That will turn on a lot of checks that may tell you what you did wrong. E.g. maybe your objects don't all have the same number of points in them. would be sufficient as my object has a closed shape (all the landmarks connect sequentially and the last landmark connects with the first landmark). But the drawing is not quite what I expected, in some point lines are crossing... any suggestions about this? That code is going to connect the dots sequentially with lines. If they cross then they cross. If that isn't what you expect then your labeling must be wrong in some way. I'll check that out thoroughly then, thanks for everything Davis!! Hi, would you please let me know the memory usage as well as the model size of your methods? Thank you. Can you please share the configuration you used for training 68 landmarks model? I see that amount of cascades as well as trees and depths are different from the default settings. it would be great to know you experience about choosing this settings. also amount of padding and how does it affect results. The model file is about 100mb. Dlib comes with an example program that runs this algorithm, so you can run that program to see exactly what kind of computational resources it consumes. As for training parameters, I believe I used the defaults except that I changed the cascade depth to 15. If you want insight into how the parameters effect training then I would suggest playing with the example program and reading the original paper as it contains a detailed analysis of their effects. I downloaded your landmark detection program and It works well in the single image. I assumed that a single image is given continuously. Then, the shape in the first frame was good but the shape is crushed as time goes even though all images are same. I think there's some strategies to solve this problem for the tracking in the video. Do you have this kind of experience? Yes, doing that is definitely not going to work. If you want to track faces just run the face detector on each frame and look for overlapping boxes. Then, to make the video on this post, you detect the face on every frame, and start with mean shape on the detected bounding box. Am I right? Yes. It's just like in the example program. I want to overlay a string on one image window (eg.win), which function I should use? should I write win.add_overlay(string ..) something like this? Also, I want to combine 2 windows(eg. win and winc) in to one window,which function I should use? After reading the dlib, I failed to find such functions. Could you help me? Could you do me a favor? Badly needed. Thanks so much! Davis, I cannot thank you more!! BTW, Is it possible to put one smaller image_window on one corner of another bigger image_window? No. You have to build an image yourself that looks like that and give it to the image_window. fantastic work. Do you have any suggestion for head roll, pitch and yaw? You can certainly calculate roll/pitch/yaw based on the positions of the landmarks. However, I don't have anything in dlib that does this calculation. Hi David. Thanks for your fantastic work and contined support. As with Chris Collins' comment, I'm looking to calculate the yaw/pitch/roll based on the landmarks. Do you have any advice on how to go about this given that, as you say, dlib doesn't handle this? Any help you could give would be much appreciated. Can put a link to the dataset used to train the example model provided with DLIB? Thanks. That's where I got it from. I used all the data they provide on that page you referenced. It's really great work. I have one question. Where can I find the corresponding positions for the 68 landmarks? Since I may want to select a few key landmark points based on where they lie on the face. Thank you. If you open one of the training xml files in the examples/faces folder with the imglab tool (found in tools/imglab) it will display the annotations with their labels. which face-detector did you use to train your model (i.e. get the initial bounding box for the faces)? Do you use the bounding-boxes provided by the 300W dataset, or do you run the dlib/opencv/... face-detector on the images? Is there a way to evaluate how the shape predictor performs in the code? like the score given by face detector? Thank you. Not in dlib, you will have to create your own evaluation metric to predict this. Is it possible to generate a shape predictor for faces with a smaller size (<95MB)? If so, how can I achieve that? Thank you for your response. So, by training with a higher nu and decreasing the tree depth the predictor file will be smaller? What values do you suggest, with a good trade-off between detection peformance and file size? Which were the parameters you used to train the available predictor shape file your making available? Nu has no effect on the size. The tree depth, number of trees, and the number of landmarks has an effect. You will have to try different things and see how it works out. I've trained the predictor on the HELEN data set and am not getting good results. I obtained both the training landmarks and the bounding box initializations from the i-bug site (http://ibug.doc.ic.ac.uk/resources/300-W/), and it describes them in the format Xmin, Ymin, Xmax, Ymax. However, in the sample training XML file, these are defined as top, left, width and height. I assume this means 'distance from top, distance from left, width of box, height of box' - as such my bounding boxes are defined as: Ymin, Xmin, (Xmax-Xmin), (Ymax-Ymin). To test this, I'm using one of the training images as input (in order to minimize inaccuracies which may occur as a result of a small training set), and the resulting landmarks are largely misaligned. So my question is: are my assumptions regarding the bounding box correct? Or should I not have manipulated the BB initialization data? Yeah, that's right. You can also open the xml file with the imglab tool in dlib and see if the annotations look correct. Is it makes any difference if, instead of using imglab tool to annotate the parts of an object, I manually add the coordinate pixels directly editing an XML file? Because I feed this into the shape predictor trainer and when I run the landmark detector the rendering is awful. I opened my XML file in imglab and the annotations are correct. There were a pair of little mistakes that I fixed, also confirmed there were ok in imglab again, but still! the rendering keeps crossing lines that should not. I verified all the landmarks were sequentially well accommodated with zoom in imglab, so I don't understand what is going on. That's why I was thinking maybe the shape predictor trainer is not reading my XML file as it should, because is not a direct output of annotating with imglab. I just modified the training_with_face_landmarks.xml file that was on the "examples" folder. Also, I would like to thicker the rendering lines. I've been looking through several files... widgets_abstract, metadata_editor, base_widgets_abstract, drawable_abstract, canvas_drawing_abstract, but I don't seem to find the line where I can change that parameter. Any idea? How can I assign new values to the points in dlib.full_object_detection in python? It seems direct assignment is not allowed? I can get a list of points that can be used to initialize the shape. Karla - are your points between 0 and 9 labeled as '00', '01', '02', rather than '0', '1', '2'? If these aren't labeled correctly, it results in issues rendering the lines. Just thought I'd mention it as I made this mistake myself. You can create a full_object_detection by calling it's constructor with a rectangle and a list of points. I'm currently applying this to a video, just like the video demo you have posted. I'd love to use the previous predicted shape to initialize the shape_predictor rather than the rect, so that we don't have to detect faces or initialize with the standard shape to every video frame. Is there a way to get around this? or I have to modify the code myself. However, I'm not seeing anywhere close to one millisecond performance. I'm compiling the example program with g++ on linux with a core i5 processor. If I run it on some smaller images, it takes about 5-10 seconds. If I run it on the larger HELEN images, some of them take over 1 minute. I thought maybe I'm misunderstanding which part only takes a millisecond, or what kind of hardware the test was done on. But from this blog post above: "As the name suggests, it allows you to perform face pose estimation very quickly. In particular, this means that if you give it an image of someone's face it will add this kind of annotation:"
"In practice with a single CPU our algorithm takes about an hour to train on the HELEN dataset and at runtime it only takes about one millisecond per image." Sorry to ask again. My previous post doesn't work. For your demo video, how do you locate the face? by doing face detection every frame(which would be slow) or use some other tracking algorithm? I used the example program linked to from this blog post. But then it won't catch the original fps? since the detector would take ~0.3 second. It runs at about 15fps on my machine. Is there a way to evaluate whether the facial landmarks have been occluded? or what would you suggest to build on what we have if there isn't. Thank you so much! No, that's not part of the current implementation. There are a variety of ways you could estimate this though, the easiest is probably to train some kind of HOG based classifier that looks at each landmark and classifies it as occluded or not occluded. I'm about to apply this technology to my project, which needs to detect 4 features of a face (eyes, nose, mouth). What I'm trying to do is to re-train a 4-feature detector to reduce memory footprint. I understand the quality of the annotation is key to performance. Can I have your annotation file so that I can have a solid foundation to start with? I want the algorithm to extract features also from outside the shape. Especially in y-direction, above and below the shape. Is this possible directly or do I need some code adjustments? Can I do this using this function: set_feature_pool_region_padding? Yes, that's what the padding parameter controls. I'm trying to extract facial landmarks from an image on iOS. For that I followed face_landmark_detection_ex.cpp example, and I used the default shape_predictor_68_face_landmarks.dat. It is recognising the face from the image successfully, but the facial landmark points which I'm getting are not correct and are always making a straight diagonal line no matter whichever facial image I use. I also tried using cv_image instead of array2d but no luck. Can you point me towards what I need to do in order to get facial landmarks of a frontal face image. The example program mentioned in the post is a complete example showing how to run it. Did you run it unmodified? Or maybe your image is too hard and you need to try another image. Thanks for the quick reply. The only thing I modified with the example code is that instead of dlib gui component to display the image I'm displaying the image on iOS UIImageView and I'm storing all the 68 shape positions by creating CGPoints from them and displaying a UIView at those points. Here's the result I get: http://imgur.com/gallery/QgRbXm9/new. The image has dimension of 201 X 250 pixels. I tried several images of several dimensions and sizes but the output is always the same. It successfully detects whether the image contains a face or not. Hey Davis, I got it working. Thank you for the great work! Hi Davis, I have 16 gb memory on my system and training on the full dataset in http://dlib.net/files/data is overflowing memory and that's using only the default cascade_depth of 10. Can you mention the amount of memory on the system that you used for training? Can the trees be trained incrementally or is there another way to reduce the memory footprint? My computer has 32GB of ram. It's taking a lot because the image data is just big when uncompressed and loaded into ram. So you need to buy more ram. Is it possible to make detection faster in python currently I am getting a frame rate below 10 on video, I just require the eye corners and nose tip, is there a way to selectively make the detection(do I have to perform my own training)? Will that speed it up? Do you happen to have the xml file you used for training? Thanks. If I had 100,000+ annotated images, obviously they can't all fit into memory. Is there a way to incrementally train the model in DLIB without loading all the images at once? I think this might be a bit trivial, but could not find any documentation for imglab. Is it possible to delete specific numbered points from all the images in the training set, manually deleting each point will take me weeks. Has anyone ported to a mobile if so what is the frame rate? any slimmed down version of the lib that can be used for a mobile integration? JITEN devlani, looks like you did the iOS integration, can you mail me at smear1@gmail.com please or anyone interested in doing contractor work based on this? In my experience it runs in milliseconds on the mobile. If you want to reduce the size I would recommend storing all values as float16 and reduce the number of landmarks. Depending on your actual application you might not need all 68 landmarks. You also can trade some accuracy vs. size by setting the maximum tree depth to 4. What is the total size to port the feature point code to mobile? Also any comments on how the algorithm is robust to pose changes? If the first frame is the face detection box then after that I use the location of the last frame to seed the algorithm, the algorithm wont be reliant on the face detector just how good the feature point detection is and im assuming at some pose it becomes unstable. Any do the implementation like this? Does that algorithm give a flag if it fails to find good points? I guess it's best if you look into the code yourself. The main algorithm consists of just 2-3 header files... There are dependencies to the serialization and matrix multiply code though. If you want to port/rewrite the code you might want to use Armadillo + OpenBLAS or Eigen for the matrix stuff, which both accelerate BLAS operations with NEON instructions. @Confidence estimate: Nope, you either go for something like joint-cascade or run a detector in some background-thread which tries to re-find the face. Lots of people use dlib on mobile platforms so you shouldn't need to port the code. Also, dlib's linear algebra libary will use OpenBLAS or any other BLAS just like Armadillo so there isn't any point in switching. Can you please provide a link to the IBUG dataset that contains all the images that you trained on? From the current link that is available on your blog, http://ibug.doc.ic.ac.uk/resources/300-W/, I could only get about 100 and odd images. Is IBUG data - the set that you trained on, which had a few thousand images, a collection of other databases - LFPW, Helen, XM2VTS? sorry for asking, but I am really new to programming, and I can't figure out how to decrease the number of landmarks eg. to 51? Could you help me, where should I modify the code? I need to estimate the roll/pitch/yaw angles using the face landmarks. Could you please give me some advice on how to do it? Or possibly a piece of code that I can use. This isn't included in dlib, so you are unfortunately on your own. I'm sure there are papers and tools in the internet to assist with this but I don't know which ones are best. Is it possible to restart bounding box based on the previous frame shape without using detector? Yes, in the provided example program you can see where it calls the shape predictor with the bounding box. You can change the example program to pass in some other bounding box generated however you like. I'm trying to extract facial landmarks' coordinate from face_landmark_detection_ex.cpp to do my research. I've tried the way you discussed with Emory, but it doesn't work. could you please help me figure out what's wrong with the code? when I tried to compile face_landmark_detection_ex.cpp with the code i wrote, it would cause errors. I think there are something wrong with declare v.
Is that anything wrong with it? Do you happen to know if I overlooked anything? Should I call a different function? First of all congratulations for your fantastic work! I have a question related to landmark detection using hog_object_detector. Is there a way, while or after evaluating each one of the regression_tree elements in the forests of having some kind of a confidence factor? I'm currently trying to find some kind of a quality metric for the detected landmarks and your help would be highly appreciated. You have to train your own classifier to provide such a confidence value. I would start by using the sparse feature vector that is output by the shape_predictor. Thank you for your prompt response! What I meant is if there is a way of getting a metric from the actual evaluation result, like some kind of quality measure. I understand what you mean by training with a different confidence value, but that will be a one shot operation. During runtime I won't be able to infer the actual quality of the fitting/matching result, right? congrats for your great work. I have many questions about tracking from webcam. Qst. 1) I'm running webcam tracking example on a MacBook Pro 4core 16 giga ram. When i run the release built, performance is not so good, even if SSE/AVX is enable. Qst 2) May be correlated to Qst 1. I've changed the example source code enabling face detection only one time to detect face position. Successively i use shapes.get_rect(); to get new bounding box. Seems to be ok but if i make a sweeping motion,although slow, with the head the tracker fails. Is it a problem of performances? Qst 3) Compared to real performances, the video showing actor speaking seems to be post-produced. Is it realtime? Qst 4) My last question is about tolerance to head yaw and pitch. Seems that the algorithm fails for very small yaw and pitch angles. Does it depends on training? Can it be improved? Try a newer version of dlib. What are the 68 points mark-up used for your annotations ? I want to know the eye coordinates . What should I do ?Thanks!!! Open one of the training xml files accompanying the example programs using dlib's imglab tool. It shows the labels of the points on the screen. Or you could just plot the output on the screen and see where each point falls on a face. I would like to transplant dilib library to the embedded platform(linux-arm), How can I do ? Could you give me some advice ? Have you tried it? You shouldn't have to do anything. dlib works without modification on linux platforms. but It can not work.Do I need to configure other parameters? I still have one question.I want to generate a shared library(.so NOT .a).How do I set the cmake parameter? Could you give me an example or some information ? I want to use this feature for my mobile app. How can I slim it down to less than 5mb as pretrained version? Any ideas what to check? OpenCV like 20x times faster. Are you running the example program that comes with dlib (http://dlib.net/face_detection_ex.cpp.html), on the provided images? If so then it should run faster than that and you must not have compiled it with optimizations enabled. Davis, im running detection through Python (not the example program). Should i provide more instructions about optimization? Is is possible to extract x,y,z angles? Janis, if you look earlier in the comments, you'll see a user named Tekerson created a project, shared on Github, that calculates a matrix for the face pose. I believe this is what you're looking for. Davis, thank you so much for your work on this incredible library and the help you've provided in these comments. I have a few questions that I'm pretty sure haven't been addressed yet. I'd really appreciate some input, if anyone has the chance. 1) Training: Davis, I see in your training set XML file that for the training images in which the face detector did not detect a face, you guessed at the face bounding box. Did you just pick a box that fit the landmarks? I'm guessing you probably did something a little more clever than that. Could you explain your guessing process? 2) Training again: I see that you've mirrored all of the images to build a bigger training set. This seems pretty clever. Could similar gains be achieved by adding random noise into the images? Also, to save memory, can't I modify extract_feature_pixel_values() to simulate the mirrored image, and then build in calls to the training procedure to extract_feature_pixel_values_mirrored() with the mirrored shape? Or do you see an inherent problem in that? 3) Shape prediction: In video, is there a way to use the preceding frame to aid the prediction for the current frame? I'm guessing the answer here is no. If I understand the algorithm correctly, the decision tree needs to be traversed from the beginning for each frame, meaning that each frame must be visited as if it's brand new. For the images that don't detect a face, I tried to use the bounding box that would have been output if the detector had worked. So I trained some simple regression model to map from the landmarks to the output box. Adding random noise could be useful. How useful will depend on your application and the kind of noise. You could certainly flip images on the fly. However, you have to map the landmarks to a flipped image in some sensible way rather than just mirroring them since a simple mirroring would do things like conflate the left ear with the right ear. Different applications will demand different ways of performing this mapping so it's best to let the user do this themselves rather than have dlib try to guess it automatically. The algorithm is inherently based on one frame. I can imagine multiple ways to design a new but similar algorithm that assumed sequential frames should have similar outputs. However, such a thing is not in dlib. Concerning your last post, how would you go about video shape prediction ? or were you thinking of another way to do this without further data annotations ? Yes, you would need sequentially labeled data. I found that if I tested with glasses, the coordinates of the face's feature point was not accurate.Could you give me some suggestion? I found that the coordinates of the face's feature point was not accurate when I wore glasses,.Could you give me some suggestion? If I want to stop detecting faces when the first face is detected (this is, I only want one face), in order to save time and go faster, what can I do? defined so you can't use the GUI code. Turn DLIB_NO_GUI_SUPPORT off if you want to use it." libx11-dev installed on your system"
#error "Also make sure you have libx11-dev installed on your system"
How can resolve this problem? Thank you! Install XQuartz. CMake gives you a message telling you this when you run it that includes more detailed instructions. Can anyone help me or guide me to steps requires for installing DLIB C++ In ios Xcode. How can get rotation of face in each x,y,z direction ? I tested your landmark detection on my 64-bit desktop and got the average speed of at least 5 milliseconds per face for 68 landmarks. AVX is used. But according to the paper, it's just one millisecond per image for 194 landmarks.